The group seeks to draw like-minded south Florida patriots together to help restore this country to its constitutional roots and elect conservative candidates, at all levels of government, who will respect our heritage of American exceptionalism, free enterprise, individual liberty, fiscal responsibility, lower taxes and limited government. 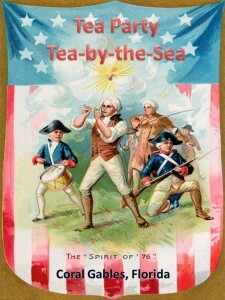 Affiliated with the Tea Party Patriots, Tea-by-the-Sea is a Coral Gables, Florida-based citizens’ group focused on returning America to its roots of Freedom, Capitalism and respect for the U.S. Constitution. We are dedicated to helping ordinary south Florida citizens mobilize to take this country back from a Socialist agenda. We will not only share our ideas and thoughts, but we will work on the ground to help elect candidates at all levels who will further these goals.